No, the title isn't purposely vague, "Cemetery Display" was the actual name of this yard display in Justice, IL. Aside from the generic title, it was rather creative, featuring a spooky Jason Voorhees, a cool Michael Meyers, and half of a body covered in raw meat and maggots (which we hope was part of the display and not something more sinister!). Krohn's House of Terrors is one of several elaborate yard displays in the Mokena area. Along with Fear on Fiona, Grant's Graveyard, and Sunny Acres, those looking for some Halloween fun at no cost need look no further. The Tourers first visited this location in 2010, and have come back each year since. The centerpiece of the display is a large pirate ship in the driveway of the haunt itself. This pirate ship practically life size, and features a fully decked out (no pun intended) interior composed of skeleton pirates. Surrounding the ship are light displays that look like flames, and the outside of the ship is lit by a series of skull lanterns. Although the ship is simply a display and is not something visitors can walk through, it is still most impressive. Feel free to check out our full review here. The Chop Shop was an accidental discovery for the Tourers - we were looking for Jason's Campsite Massacre and stumbled upon this one, which we originally thought was the Campsite location. It turns out it was not, so we wound up taking a look at this one as well. The Chop Shop display is a rather simple one, featuring a few lighted objects, some tombstones, a skeletal creature hanging from the garage, and what looks like a Jason Voorhees figure imprisoned in a cage. Overall, nothing remarkable, although there was one figure at the edge of the driveway that was motion activated and started crawling towards you once you passed. Aside from that, there's not a lot to see, although the display does hold promise. Today's review is for Nightmare at the Terrace, a great little pay haunt in Worth, Illinois. 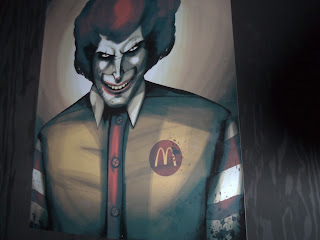 We've been visiting this one since it opened in 2009 - it's got a lot of atmosphere, some creative sets (like a homicidal Easter Bunny with missing ears), great actor enthusiasm and, at $10, some good bang for your buck. Unfortunately we didn't see a listing for 2012, so we thought it had folded, but it turns out we just missed it and it will be back in 2013, so we've very excited! We can't wait for this one to come around. Check out our full review here. Today's post is a new yard display that plays on the famous Halloween and horror them of Jason Voorhees - this one, however, is the first one we've seen dedicated solely to the Friday the 13th movies. It comes complete with Mrs. Voorhees' disembodied head and a life size Jason in a bedroom window. Check out our review here. On the right hand side of the house is a large scarecrow display, complete with the word "Boo!" spelled out in large orange lights. There is a large Creeper from the movie Jeepers Creepers on the garage roof, and a towering scarecrow-like creature that watches over all of the proceedings. One of the best things about Grant's Graveyard is that the giant scarecrow is really a live actor on stilts. In 2010, the figure looked like a Predator from the movie of the same name, and stood over the entrance to the front yard. He was so still that he fooled many people, including the Tourers, until he suddenly came to life and followed visitors around. In 2012 it was even better, as the stiltman was disguised as a skeleton-headed scarecrow hanging amongst stalks of cor. For more, see our full review here. Today's featured haunt is Nightmare on Cronin, a hone haunt in Justice, IL. This one really shows just how cool a home haunt can be. It was definitely on the level on some pay haunts we have been to, and it was free! It's hard to believe people do this in their front yards! Today's haunt review is for Frankenstein's Wedding, an elaborate home haunt/yard display in Oak Forest, IL. Frankenstein's Wedding features the marriage of the Frankenstein Monster to his bride, presided over by a maniac preacher as the main display you can see. There are also many other features on display here, a creepy cemetery in the front lawn, creatures everywhere you look, even on the rooftop! For our full review, complete with photos, slideshow, and on the spot review, click here. Today's haunt is Spirits on Sproat, a yard display located in Oak Lawn, IL. The Tourers have been visiting this location since 2009, and we always enjoy coming back to see what's new (and even what's old). The "spirits" of the haunt name are life size figures representing famous monsters from horror movies, TV, literature, and even some inventions direct from the owner's mind. Some of the more recognizable figures include Leatherface, Freddy Krueger, Michael Meyers, and Jason Voorhees, although there are many more. All of the figures are hand created, so they represent a departure from your typical Halloween stand up displays. Check out our review, complete with video walkthrough and commentary here. Just added a walkthrough of our visit to the Devil's Playground Halloween yard display in Oak Lawn, Illinois. All of the props are handmade, and the display is wired so that it looks completely dark until you approach the house. This is the only haunt where a prop scared all the Tourers at the same time! Check out our full review here. Today's review is another of the great haunts in the Mokena area. This one is called Fear on Fiona, and it's a large yard display with lots of props, both animated and static. There is a huge amount to see here, and sometimes the props are augmented with live actors milling through the crowd. This is definitely one haunt that we make a point of visiting year after year. This haunt gets very busy during the latter part of the season, so if you like a lot of Halloween action, plan your visit towards the end of October. On the other hand, if you like to look at all of the props in more quiet surroundings, visit during the week or earlier in the season. The countdown to Halloween season 2013 continues! Check out today's review - Gates of Delirium Haunted Attraction﻿ in Gilman, IL - this is simply one of the most atmospheric haunts we have been to. It has detailed sets, great actors, and it's set inside a carpeted building, which deadens sound and makes it even creepier! Although it's about 90 minutes from home base, we make a point to hit it every year. It's that good! 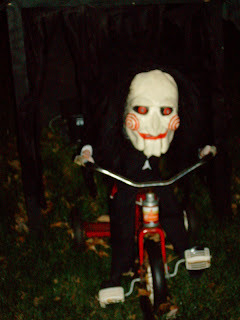 Today's haunt is a review for the Devil's Playground, which is a home haunt/yard display located in Oak Lawn, Illinois. It's a nicely done setup, with many homemade props. IT also holds the distinction of being the only haunt the Tourers have visited where all three of us got surprised at the same time! Today's updated review is for Resurrection Graveyard Haunted House﻿, one of the finest home haunts in the Chicagoland area, and one that rivals some pay haunts in quality. We stumbled upon thus haunt in 2010 and it's hard to believe this is something people do in their own front yard. The actor enthusiasm, the sets, and everything about this haunt makes it top notch. We absolutely love it! Check out our review here. Another day closer to the start of haunt season 2013! In celebration, each day we're looking back at some of our reviews from previous years. Today's review is for Chambers of Horror in Peotone, IL. This is a yard display/home haunt that grows each year. Last year's display featured some cool homemade props like a skeleton on a bike and some skeletons playing bags, as well as a display on the front porch. Although we didn't see it, there is also a home haunt portion that is set up in the backyard. It's well worth a look if you're in the area. We've just added some new photos and reviews to the web site. 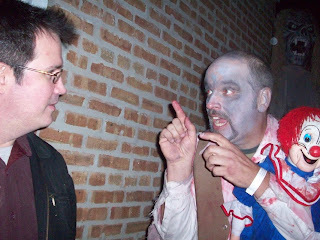 You can check out our 2011 photos from Monsters on Morris, plus some brand new reviews of Laura Lane Cemetery and Fear on Fiona. Check 'em out! As part of our continuing countdown to the beginning of haunt season for 2013, we're sharing one of our archive haunt reviews per day, right until the new haunts begin! Today's selection is Sunny Acres, a yard display on Mokena, IL that we first visited in 2012. Not only was the display itself great. but one certain nights there were live actors who really added to the atmosphere. To complement the review, we've just added two new videos - an on the spot commentary and a walkthrough. What did we think? Find out by checking our full review on Sunny Acres here. Here at Horror Tourers, we divide our haunts into three types: Pay Haunts, Home Haunts, and Yard Displays. Each type is different than the other, and in addition, there are many variations within each category. Fortunately, we at the Horror Tourers have set up some definitions for the three types that help to sort it out for you. Updated Site - New Pages and Videos! Halloween season is less than two months away! We're gearing up for some all-new haunt reviews! We've updated our site with some new videos to explain who we are and what we do. Want to know who we are and how we got started? Our About Us page will shed some light on that. Curious about the different types of haunts we visit? Check out our Haunt Types page. Want to know what criteria we use to rate haunts? Our Chainsaw Ratings page explains it all. For all this info and more, check out the Horror Tourers website! One of the new haunts we finally made our may to in 2012 was Canyon Trail Cemetery in Carol Stream. Canyon Trail Cemetery is an elaborate yard display featuring numerous animated and static props, including ghosts, skeletons carrying a coffin, and giant Jack-O-Lanterns. The operators offered some nice twists to some standard props, including modifying the skeletons carrying the coffin prop to include a skeleton corpse that popped out of the coffin. All of the props are hand-designed, and the pneumatics are homemade as well, making Canyon Trail Cemetery one of the most unique yard displays that one can visit. It's well worth a look! Check out our full review by click here. Our first review is one for The Blood Shed, a newer (2011) pay haunt located in Frankfort, IL. We visited this opening year and again in 2012. We liked it in 2011, not so much the following year. Check out our reasons why here. Halloween season will soon be upon us, and to celebrate, we're going to be revisiting some of our many haunt reviews from previous years, as well as printing new reviews in the weeks leading up to the first haunting weekend of 2013. Check back often to see what haunt we'll cover next! 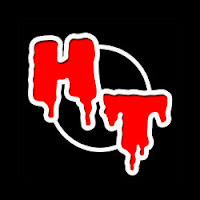 For more haunt reviews and other great stuff, feel free to check out our web site.